In Search of Sol : When nothing goes right, Go Left! Sometimes it may seem like life is fighting you. You are working yourself to the bone, trying to reach a goal, but obstacles keep blocking the way. You keep pushing past them, but eventually get fed up and frustrated. This is actually a great time to give up. Not for good, but redirect for a little while, get some fresh air, do something else. In surfing, when I am working on a maneuver I want to try it over and over and over again until I get it. And even then, I want to do it again and again. But I've found that after a few good falls, if I go the opposite direction, it can help me understand what I'm trying to do and even offer me insight on how to achieve it. 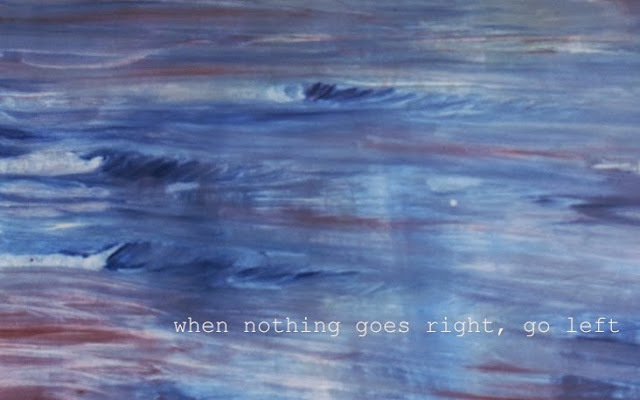 So, when nothing is going right, go left! And you may find that when you get to go right again, it turns out better than you imagined.